William Happ, midazolam: Florida’s barbaric, disgusting decision to execute a prisoner using an untested drug. 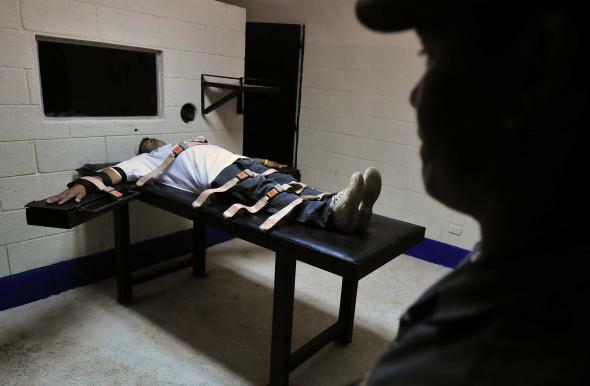 In this file photo, a prison inmate lays on a stretcher as he takes part in a simulation at the lethal unit’s execution room. Like many death-penalty states, Florida has nearly exhausted its supply of the popular execution drug pentobarbital, and has been frantically searching for an effective substitute. But while other states have halted their lethal injections until they can resolve this problem—just last week, Missouri postponed the execution of Allen Nicklasson due to concerns over the efficacy of the substitute drug propofol—Florida decided to forge ahead and deploy this untested drug. The state’s haste is barbaric and disgusting, and it sends a clear and chilling message: In Florida, the death penalty has less to do with justice than vengeance. The death penalty is currently legal in 32 states, and in all of those states, lethal injection is the primary execution method. Lethal injection was first used in America in 1982—in Texas, naturally—and was seen as a more civilized method of execution than the gas chamber or the electric chair. “We said this is really ridiculous. We kill animals more humanely than we kill people,” Dr. Jay Chapman, the father of the modern lethal-injection process, remembered to CNN in 2007. Chapman pioneered the “three-drug cocktail” execution method, in which the prisoner was administered three drugs in succession. The first, an anesthetic called sodium thiopental, rendered the prisoner unconscious and unable to feel pain from the next two drugs, which paralyzed him and stopped his heart, respectively. The thiopental was what ostensibly made the process humane; if the first drug didn’t work, the prisoner might remain conscious during the rest of the process, which would cause him tremendous pain and possibly violate the Eighth Amendment prohibition on cruel and unusual punishment. And then there’s Florida. As Slate’s Emily Bazelon reported in June, Florida recently passed the Timely Justice Act, which speeds the state’s execution process. (“Only God can judge,” one Florida legislator said. “But we sure can set up the meeting.”) Happ is the sixth prisoner put to death by Florida this year; a seventh execution is scheduled for November. Yes, “the process.” Here’s how the capital punishment process is supposed to work, as I understand it: The state gives a condemned prisoner every possible opportunity to appeal the verdict against him, and if the appeals process takes 30 years, well, so be it; it’s better to wait and be sure than to move too fast and have doubts. Then, when all appeals have been exhausted, the prisoner is executed as humanely as possible. Respect for the prisoner and for the process is what separates a state-sanctioned execution from a lynch mob. Justice requires patience. Vengeance values speed. By rushing to use an untested execution drug despite valid concerns about its safety and efficacy, Florida is willfully flouting this process, and its lawmakers should be embarrassed. For all it knows about how midazolam works as an execution drug, the state might as well have just handed the victim’s family a rusty knife and told them to go to town on William Happ’s throat. A mature state does not cut corners. A functional penal system does not act on hunches. If states cannot cite studies that show a drug is safe to use for executions, then they shouldn’t use the drug, period. When it comes to capital punishment, the ends cannot justify the means.